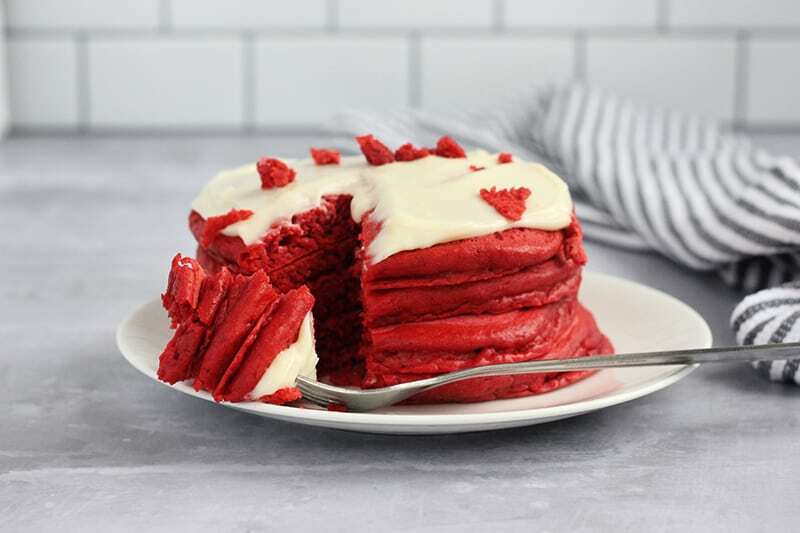 Learn how to make Red Velvet Pancakes for an extra special morning treat! These fluffy pancakes are topped with a tangy cream cheese frosting! Or more likely… Love is in my tummy. In the form of pancakes. 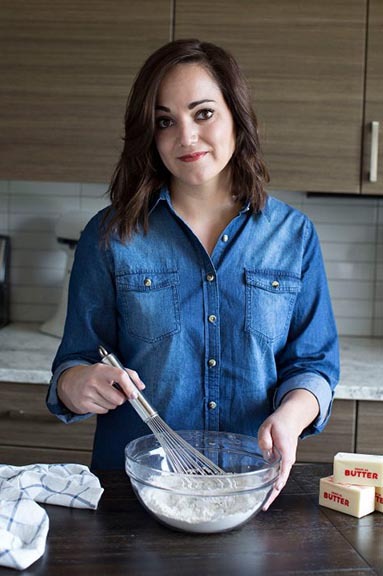 This recipe came about at the request of my child. Funny enough, most of our favorite recipes do. He wanted something extra special to celebrate the start of our day. 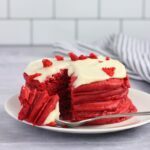 One of his all-time favorite flavors is red velvet. It seemed like a no-brainier that we would add this recipe to the mix! 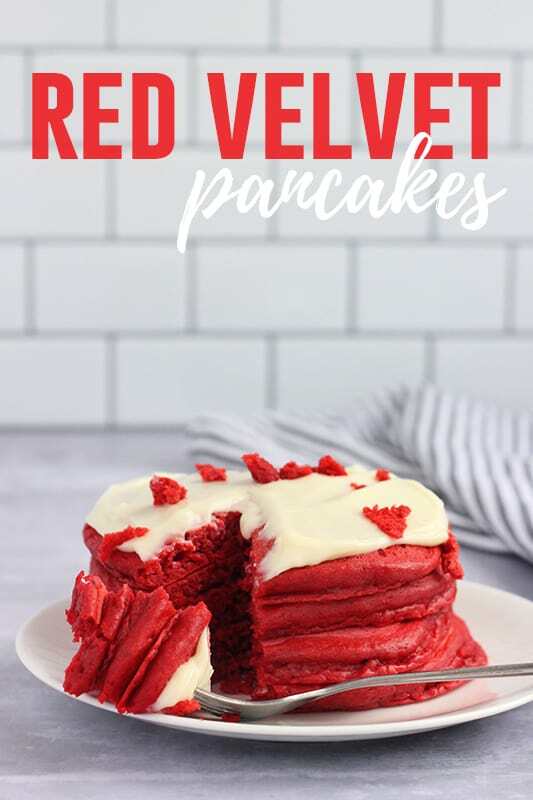 These pancakes start with the base ingredients you would see in almost any recipe: flour, sugar, baking powder – with the addition of cocoa powder! I added two whole tablespoons to give this a little punch of chocolate flavor. It definitely is not overwhelming. You get the perfect balance! How do you make light and fluffy pancakes? Follow these tips to keep your pancake making game strong. Beautiful light and fluffy pancakes are the goal so use these tips every time you are whipping up a batch! Use room temperature ingredients. This helps to ensure that every ingredient blends together smoothly giving your batter an even flavor. Mix by hand. You want to whisk you batter just until the ingredients are combined. Try not to over mix if possible. Let your batter rest for a few minutes while you prep your cooking station. 5 minutes should do the trick! Only flip your pancake ONE TIME. I know it is tempting to really get in there but keeping the flip to one time is key to success! 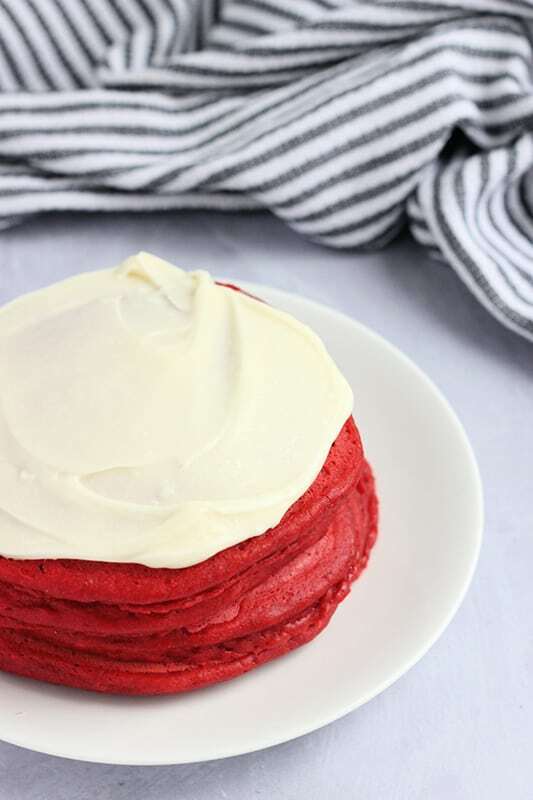 I chose to top these pancakes with a tangy cream cheese frosting. All you need is a little room temperature cream cheese, powdered sugar, vanilla extract, and whole milk! Give it a good stir with a hand mixer and spread on top of warm pancakes! However, it was quickly voted that these are also superb with just butter and syrup. Husband : Both are delish! If you want leftovers I suggest doubling this recipe. Pancakes are a GREAT freezer meal! Allow your pancakes to cool completely after cooking. Stack with a piece of wax paper between each pancake. Store in a freezer zip top container. When you are ready to eat simply remove the wax paper and microwave for 30 seconds to 1 minute. 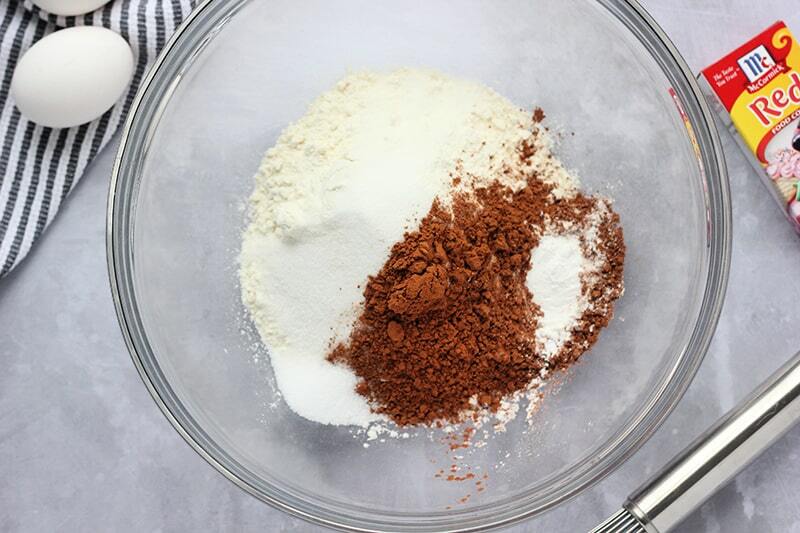 Whisk together the flour, sugar, cocoa powder, baking powder, and salt in a medium sized bowl. Combine the eggs, milk, buttermilk, vanilla, vinegar, and red food color in a large measuring cup. Whisk to combine. Fold the wet ingredients into the dry ingredients until combined. Spoon 1/3 cup of the batter onto a slightly heated pan. Cook on low heat until the edges curl up and bubbles appear on the top of the pancake. Flip and continue to cook 1-2 minutes or until your pancake is cooked through. Combine all of the ingredients in a small bowl. Whisk using a hand mixer until fully incorporated. Serve pancakes with butter and syrup or frosting. *We actually prefer this recipe with just butter and syrup. 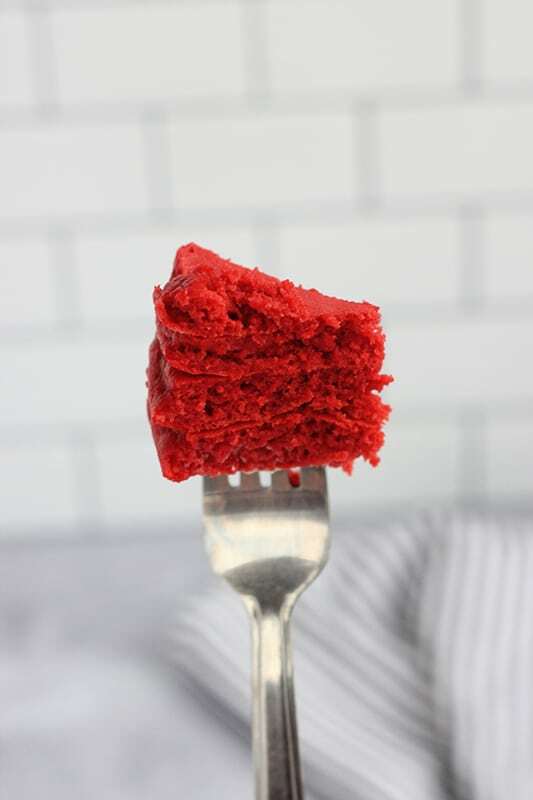 However, the frosting is a fun traditional red velvet topping and nice for a treat.